The 2016 presidential exit polling reveals little change in the political alignments of U.S. religious groups. Those who supported Republican candidates in recent elections, such as white born-again or evangelical Christians and white Catholics, strongly supported Donald Trump as well. Groups that traditionally backed Democratic candidates, including religious “nones,” Hispanic Catholics and Jews, were firmly in Hillary Clinton’s corner. White Catholics also supported Trump over Clinton by a wide, 23-point margin (60% to 37%), rivaling Romney’s 19-point victory among those in this group. Trump’s strong support among white Catholics propelled him to a 7-point edge among Catholics overall (52% to 45%) despite the fact that Hispanic Catholics backed Clinton over Trump by a 41-point margin (67% to 26%). Like Hispanic Catholics, religious “nones” and Jews were strong Clinton supporters. Indeed, nearly seven-in-ten religious “nones” voted for Clinton, as did 71% of Jews. Most people who identify with faiths other than Christianity or Judaism also favored Clinton over Trump, 62% to 29%. Exit polls also follow another pattern from recent elections: Most weekly churchgoers backed Trump over Clinton, 56% to 40%. Those who said they attend religious services more sporadically (i.e., somewhere between a few times a month and a few times a year) were closely divided. 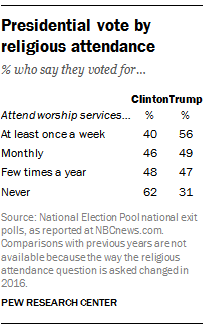 And, those who said they don’t attend religious services at all backed Clinton over Trump by a 31-point margin (62% to 31%). There is one caveat, however; while exit polling from previous elections shows similarities, direct comparisons between 2016 and previous years are not possible because the wording of the question about religious attendance changed in 2016. Finally, the religious makeup of the electorate remained largely the same, although there were some small differences between voters in this election and those in other recent presidential contests. While roughly a quarter of voters in 2016 described themselves as white, born-again or evangelical Christians (26%), which is unchanged compared with 2012 and 2008, the nearly one-quarter of Catholic voters (23%) may constitute a slight decline in the Catholic share of the electorate, compared with 2012 (25%) and 2008 (27%). In addition, religious “nones” accounted for 15% of all voters, a modest 3-point increase since 2012. This preliminary analysis reflects data for 2016 as published by NBCNews.com and/or CNN.com as of 11 a.m. on Nov. 9, 2016. If data are subsequently re-weighted by the National Election Pool (NEP), the consortium of news organizations that conducts the exit polls, the numbers reported here may differ slightly from figures accessible through the websites of NEP member organizations.